The 2017 Nashville NeighborhoodLIFT program will help support affordable and sustainable homeownership through a commitment to homebuyer education and homebuyer support. NASHVILLE, Tenn., September 26, 2017 /3BL Media/ - Wells Fargo & Company (NYSE:WFC), NeighborWorks® America and its network member Affordable Housing Resources today announced the NeighborhoodLIFT® program is coming to the Nashville area with a $4.2 million commitment by Wells Fargo to boost homeownership. This will be Wells Fargo’s 54th LIFT program event in the U.S. Interested homebuyers can attend the free event Oct. 6–7, when eligibility will be determined for an opportunity to reserve a $15,000 down payment assistance grant. The Wells Fargo NeighborhoodLIFT program will begin with a free event Oct. 6–7 from 10 a.m. to 7 p.m. at the Music City Center, located at 201 5th Ave S., Nashville. To learn more about the eligibility requirements and to register, visit NeighborhoodLIFT.com or call (866) 858-2151. Pre-registration is strongly recommended for an opportunity to reserve a down payment assistance grant. To be eligible, annual incomes must not exceed 80 percent of the local area median income, which is about $54,950 in the Nashville community for a single household with a family of up to four members ($59,350 for a family with five members). Income maximums may vary depending on family size and type of loan. Veterans and servicemembers, teachers, law enforcement officers, firefighters and emergency medical technicians may earn up to 100 percent of the area median income, which in Nashville is about $68,700 for up to a family of four and $74,200 for a family of five. Approved homebuyers will have up to 60 days to finalize a contract to purchase a home in the Nashville area to receive a grant. Participating communities include greater Nashville, specifically in the counties of Davidson, Rutherford, Sumner and Wilson. To reserve the full grant amount, participants buying a primary residence with the NeighborhoodLIFT program must commit to live in the home for five years. Participating homebuyers can obtain mortgage financing from any qualified lender, and Affordable Housing Resources will determine eligibility and administer the down payment assistance grants. 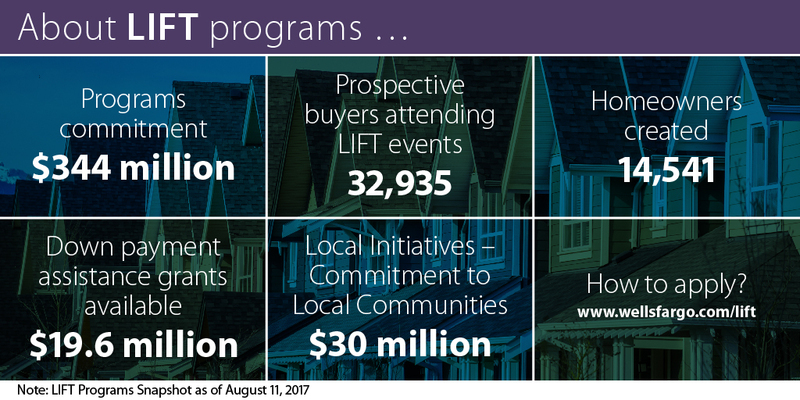 Since February 2012, LIFT programs have helped create more than 14,600 homeowners in 53 communities. A video about the NeighborhoodLIFT program is posted on Wells Fargo Stories. Affordable Housing Resources is the oldest nonprofit housing organization in Nashville and also a chartered member of NeighborWorks America, a national organization that creates opportunities for people to live in affordable homes, improve their lives and strengthen their communities. NeighborWorks America supports a network of more than 240 nonprofits, located in every state, the District of Columbia and Puerto Rico. Visit http://www.crhdc.org/or http://www.neighborworks.org/to learn more.